A few geological definitions, on the purpose of better understanding the origin and structure of the Dolomites. Most Dolomitic rocks are of sedimentary organic marine origin, i.e. originated by slow deposition on the sea bottom of the shells of sea animals and other organic detritus. In detail, the Dolomitic rocks deposited when the sea was shallow (lagoons, coastal platforms). The sea bottom was sinking; as it got deeper, new layers could deposit. At periods, sedimentations was interrupted and a thin silt layer deposited, so that the rock was divided into overlying layers (strata). In the rock, mineralized but still recognizable shells or skeletons were sometimes incorporated, the so-called fossils. Later on, under the pressure of the overlying layers, the deposited material compacted into solid rock, like that we can see today. The deposition of Dolomitic rocks started in the Anisian period and ended at the beginning of Cretaceous. 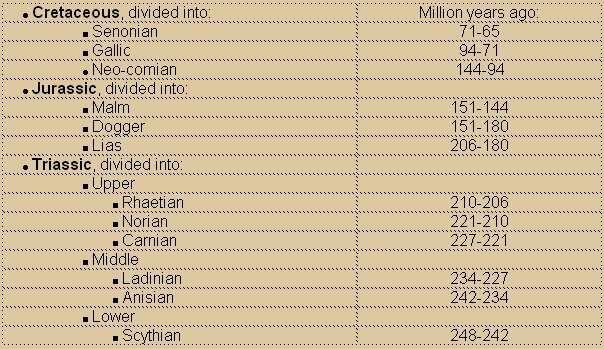 During the Ladinian period, two volcanoes emerged, east of the Fassa valley, that erupted the dark rocks like those of the Padon and of mount Pore. 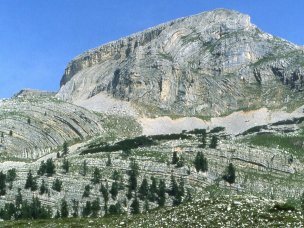 The dolomite deposited during the Norian period represents the largest part of the classic Dolomitic cliffs and was named Main Dolomite. Strata near the big Fanes Alp. Remark the sub-horizontal layers in the foreground and the inclined, contorted and broken ones on the left and in the background. What remains of the Marmolada glacier. Notice the rocks in the foreground, smoothed by ice abrasion. (Photo: Vanin). The sedimentary layers of the Dolomites remained for several million years buried deep under the sea bottom, where they compacted into hard rock. About 25 million years ago, the push of the African continent against the European plate started lifting the Earth’s crust, forming the Alps. Because of this phenomenon, the Dolomites also were raised up to thousands meters above sea level and exposed to daylight. The movement caused the strata to incline, to bend, to break. As soon as they start emerging from the sea, rocks are subjected to erosion, mainly for the action of rain and of snow-melting waters. This way the network of the river valleys takes shape. Stones and boulders detach from the cliff walls and form scree slopes (talus); rivers carry them away, grind them, round them and sometimes deposit them in the lake basins or on the sides of the valleys. A peculiar phenomenon is karstification, typical of the rocks soluble into water, like dolomite (a little) and limestone (much more). Instead of flowing on the surface, water penetrates underground through the joints that have opened during the process of mountain raising, and enlarges them wider and wider, forming caves. On the surface, dry stonefields remain, marked by deep grooves (karren, lapiaz) and funnel-shaped hollows (dolines). A stream may suddenly disappear underground (sinkhole). Water reappears at the base of the mountains, forming karstic springs. When temperature is low enough and humidity high enough, on the mountains we have the formation of glaciers. 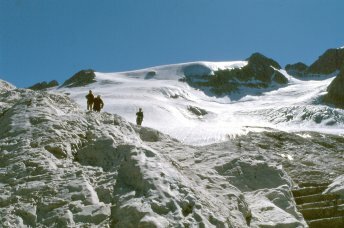 Ice cumulates in high-altitude basins, moves downwards very slowly, forming iceflows, sometimes carrying detritus that is relinquished where the ice melts (moraines). This phenomenon was specially intensive in the so-called Ice Ages of the Quaternary Era, separated by warmer periods called interglacial stages.